Months before the release of Guardians of the Galaxy and star Chris Pratt's ascension to the A-list, a rumor was floated online suggesting that the actor was flirting with the lead role in yet another big franchise. According to reports, the Parks and Rec star was "in talks" to play Michael Knight in a brand new Knight Rider movie. That was back in February, and we haven't heard a peep about it since. That is, until this bit of weirdness passed across our desks here at Cinema Blend. KITT pulls up to Hassellhoff's make-up desk with someone sitting in the driver's seat, the original Michael Knight asks who is driving, and... wait, is that really Chris Pratt? While I'm about 99.999% sure that the actor pictured above isn't actually the Guardians of the Galaxy actor - I think it's just a look-a-like - does anyone else find this situation just a tad bit bizarre? Did Samsung's marketing team hear about the Chris Pratt rumors and decided to make a joke about it in the commercial? Or maybe they just got a Pratt look-a-like because the real star happens to be the most buzzed about actor in Hollywood now. Or maybe we're just reading way too far into this and it's not a Chris Pratt look-a-like but instead just some random dude. 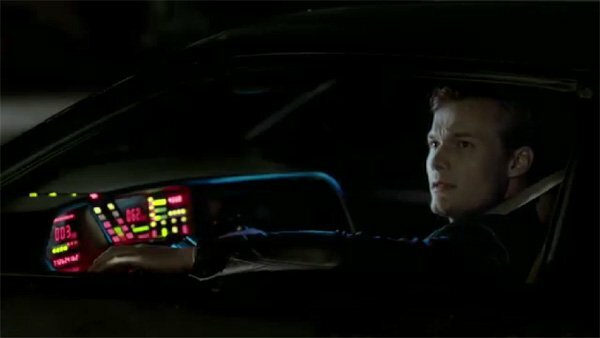 Regardless of the truth behind the commercial, we certainly shouldn't take this as any indication that things are moving forward with a Knight Rider, either with Chris Pratt or without. It's worth mentioning at this point that Danny McBride was written up in the same original rumor as Pratt, and was said to be the new voice for KITT (which obviously doesn't sync up with this ad). My assumption is that Pratt is far too busy with the budding Guardians of the Galaxy franchise, not to mention Jurassic World, to really spend any time thinking about a Knight Rider movie, but I've been wrong before. Is this an idea you would actually want to see Hollywood pursue?